Beveled glass enhances the graceful and almost frameless look. 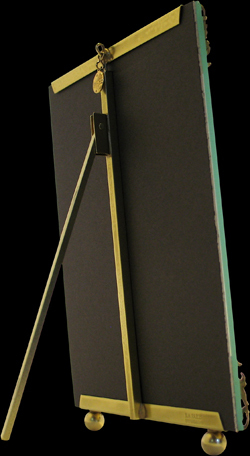 Our easel type construction utilizes an unseen compression spring concealed within a square tube in the back of the frame. By gently pulling apart the top and bottom channels tension is released and a photograph can easily be inserted. Almost every frame is available in the following sizes of beveled glass: 3.5x5, 4x6, 5x5, 5x7, 7x7, 8x10 & 10x10. When ordering please be sure to indicate V for vertical and H for horizontal. All our frames are offered in solid brass and 99.9% pure silver plate with a clear lacquer finish to prevent tarnishing. When ordering indicate S for silver plate. To provide a hallmark for the collector, we hand stamp our name into back channel of the frame. Every frame includes a printed guarantee, instructions and information. We do not accept credit cards. Please send a check in advance, pay via UPS COD, or pay by direct deposit. We ship from Santa Barbara, California via UPS Ground unless otherwise specified. Every frame is individually boxed. Orders can be placed by Phone/Fax 805.563.4744 or by email: email@LAParisStudios.com. Be sure to include your name, shipping address, and phone number.